ELM GROVE — Several times each week, pediatrician Dr. Andy Swietlik, his wife Julie, and their nine children drop by the neighbor’s house to spend quiet time with a loved one. They spend their time in prayer – sometimes praying the rosary, sometimes praying the Stations of the Cross, and sometimes praying in other ways. Often the children drop by on their own, open the large doors of St. Mary Visitation Parish, and enter the adoration chapel in an effort to grow closer to their friend Jesus. Members and friends of St. Mary Visitation Parish have tallied 218,000 hours of prayer in continuous eucharistic adoration since the Feast of the Holy Rosary (Oct. 7) 1985. The parish marked this milestone on Oct. 6, with a prayer service, Benediction and social gathering. No matter what time of day or night, or which day of the year, with the exception of Holy Thursday through the Easter Vigil, at least one person remains before the Blessed Sacrament, and generally two volunteers are scheduled around the clock to ensure someone is always present. When former St. Mary Visitation member Don Riemer learned about perpetual adoration from a Catholic magazine in the 1980s, he knew it was something he wanted to pursue at the parish, so he approached his late pastor, Msgr. Joseph E. Emmenegger, about the possibility. While enthusiasm was great in the beginning, continuing the prayerful practice took a bit of ingenuity, especially as the air began to chill and the snow blanketed the roads. Most touching to Riemer was the faithfulness of a now deceased elderly gentleman who kept a 3 a.m. vigil in the tiny chapel. It was his sole desire to gaze upon the Lord and await his homecoming. When the cramped space became too small to accommodate those wishing to stop for a visit, the chapel was relocated to the former parish baptistery where it is today. In 2006, the chapel was renovated to seat 12 among ancient relics, icons and a hand-carved crucifix from Jerusalem. Since then, husband and wife team, Dr. Jerry and Fran Auger, have taken over decorating and cleaning. While many eucharistic miracles exist, according to Vatican-approved documents, such as the miracle documented in 8th-century Italy, when a doubtful priest witnessed the Communion host transform to human tissue as he consecrated it, worshippers at the St. Mary Chapel find solace with or without dramatic occurrences in their own lives. Some who come to fill their slot among the 168 hours per week often enjoy praying during the early hours. Others appreciate spots later in the day, where they can cast aside their cell phones, dim the noises of the outside world, ignore the traffic and rest in the comfort of holy silence. For the Schwarzes, stopping in every day, even for a few minutes, has kept the couple close to God and to each other. Like many couples who began 25 years ago, parishioners Al and Kay Eberle have a set time each week for eucharistic adoration. In an effort to streamline the volunteering process, a steward program was recently started to oversee the scheduling. Riemer remembered that Msgr. 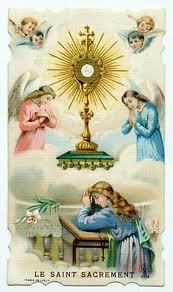 Emmenegger often alluded to the many blessings the practice of eucharistic adoration has brought to St. Mary Visitation.